About the only bright spot from Saturday was how well Dervite played. Somewhat like Andy Hughes towards the end of last season it's a little difficult to put your finger on what he does. He can almost go unnoticed. I can't recall him having had a bad game. He can and has played in midfield too of course where I think he does an equally good job. We'll have to hope that other teams don't notice him too much either as, like so many others, his contract expires at the end of the season. Dorian started out at La Madeleine of which Dorian recalls little as he has problems with a remembrance of things past although he remembers it being a piece of cake. Dervite joined Lille in 1999 and stayed for 7 years until he joined the Tottenham youth team in 2006. Sadly a knee injury in January 2007 sidelined him for a few months. Keen to make up for lost time, he joined Southend on loan in Janaury 2009 where impressed and was runner up for player of the year despite only playing half a season. 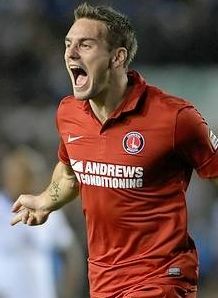 In 2010 he joined Villareal B playing just 23 games until his departure in 2012 to join Charlton. He has played for the French under 16's through to under 21's with his last international appearance in 2009. Still only 25 who's to say that he might not yet make a full international appearance for his country. Dervite had to wait a while before establishing himself in the team something he has now achieved. Following Saturday's defeat to Boro he has called for his teammates to remain calm, be patient, work hard and approach treat each game with seriousness and respect. Clearly he appreciates the importance of being earnest and this should stand him in good stead.